We have really enjoyed the February issue of Vegetarian Times. We found many vegan recipes, as well as many others that we can easily make vegan. This recipe looked so inviting, I just couldn’t resist it, and we found it to be as good as all of our other Brussels sprout recipes. The only thing I did differently, was to steam the Brussels sprouts rather than to stir fry them. This recipe is really a keeper, and I’m glad to see that there are still 4 stalks of Brussels sprouts growing out in our garden, despite the fact that we’ve had below freezing temperatures since December. 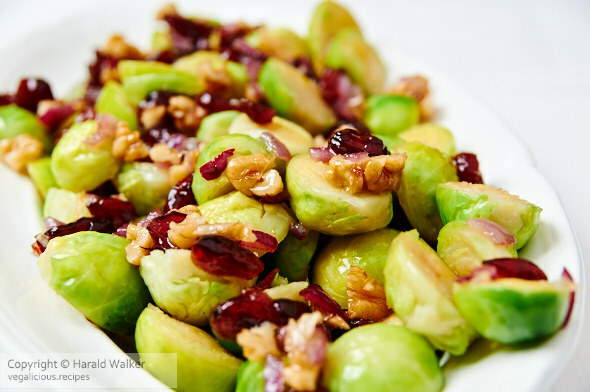 Posted by Chris Walker on February 27, 2009 in Brussels sprouts, Cranberry, Reviews, Walnut.